© Provided by Guardian News Manafort and his lawyer Kevin Downing in May. Donald Trump’s outbursts against the special counsel investigation into Russian interference in the US election have become a near-daily occurrence. But on Friday the president made public comments that some observers and legal experts said were unprecedented – and could impact the objectivity of jurors. Addressing reporters on the south lawn at the White House, Trump said his former campaign chairman Paul Manafort was “a very good person”. At the same time, 23 miles away in Alexandria, Virginia, a jury was deliberating Manafort’s fate. 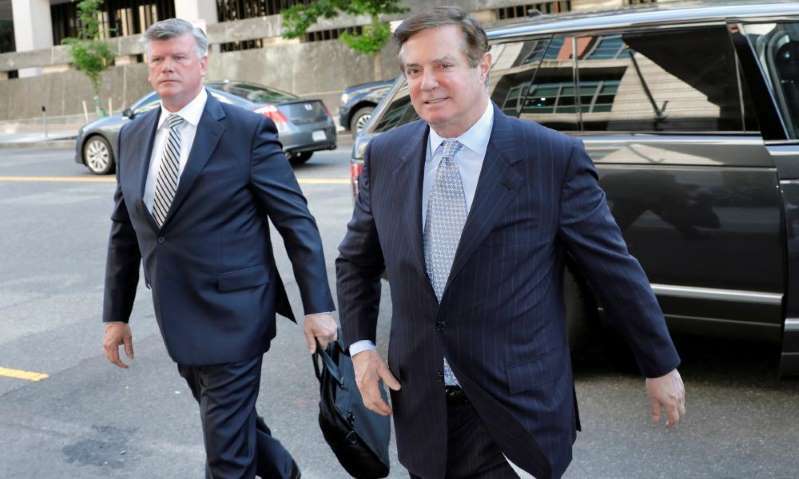 Manafort faces up to 305 years in prison on 18 counts of bank fraud and tax evasion, as a result of an indictment handed down by the special counsel, Robert Mueller, relating to Manafort’s political work in the former Soviet Union. [post_ads]On Saturday, with the jury recessed for the weekendbefore an expected third day of deliberations on Monday, legal experts said it was highly uncharacteristic for a sitting president to weigh in on an ongoing trial, much less one involving a former aide. “It’s incredibly unusual and perhaps unprecedented that a president would weigh in like this during a criminal investigation that’s actually gone past the indictment stage and is now at the jury deliberation stage,” said Greg Brower, who until April was the FBI’s top congressional liaison. Susan Low Bloch, a professor at Georgetown University Law Center, said Trump simply “shouldn’t have done it”. Trump has defended Manafort before. On the first day of testimony in court, the president tweeted that his former aide was being treated worse than Al Capone, the notorious 1920s gangster who was imprisoned on charges of tax evasion. The jury in Alexandria has received typical instructions not to read or watch the news but Judge TS Ellis chose not to sequester its members for the duration of the trial. That means they could be exposed to Trump’s comments. The charges against Manafort do not concern Mueller’s investigation of Russian interference in the 2016 election, links between Trump aides and Moscow and potential obstruction of justice by the president. Nonetheless, jurors may also come across a bombshell story published by the New York Times on Saturday, which said White House counsel Donald McGahn has “cooperated extensively” with the special counsel, “sharing detailed accounts about the episodes at the heart of the inquiry into whether … Trump obstructed justice”. Sequestration of a jury, which is rare, is usually invoked when publicity surrounding a trial is especially high, in the aim of preventing any interference with juror objectivity. On Friday, Ellis said he had not anticipated the “emotions” stoked by the trial, stating in court he had personally been threatened and was under the protection of US marshals. He also declined to release the names of the jurors, citing concerns regarding “peace and safety”. Bloch said that while it was unusual for a judge not to have sequestered the jury in such a high-profile case, it was difficult to fault Ellis without knowing how he shaped his decision. It was not clear if Trump was aware the jury had not been sequestered. The president has routinely sought to discredit Mueller’s investigation, suggesting without evidence there is widespread bias against him within the FBI. This week, Trump escalated his attacks by revoking the security clearance of former CIA director John Brennan, who has been a vocal critic. The White House initially said Trump’s decision was taken because Brennan had monetized his position and leaked classified information – claims not backed with evidence. The president then admitted he has targeted Brennan and others who played a role in the Russia investigation, which began during the 2016 election. Brower said Trump’s efforts to undermine Mueller’s investigation ignored the fact it was being overseen by his own appointees at the justice department. “We have the president criticizing a case that was approved by people at Department of Justice who ultimately report to him,” he said, pointing out that both deputy attorney general Rod Rosenstein and FBI director Christopher Wray would typically be briefed on developments in Mueller’s work. “They both implicitly approve of what the special counsel is doing. They clearly have no reservations about the charges or the way the special counsel has gone about prosecuting the case – and those are Trump appointees.